I was astonished by the warmth it provides. At 77g (2.7oz) the 'K Series' WaferLite vest is the lightest down vest in the world. 38% lighter than our superlight standard Wafer Vest. The 7X fabric gives total windblock and the unique 1000 fillpower down provides the highest warmth-for-weight performance possible. Packed into a tiny stuff sac, the WaferLite vest is simply breath-taking for summer racers, ultra-light trekking, and those counting every gram. 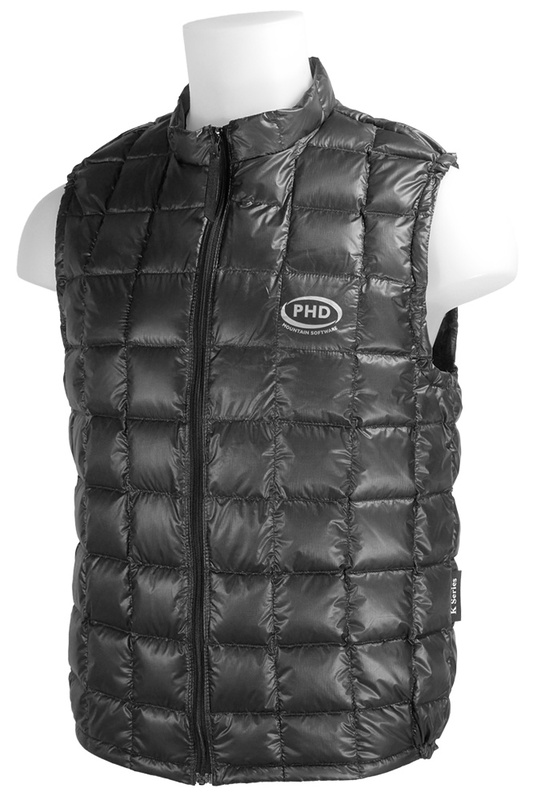 The WaferLite vest will fit snugly under any of our down jackets, even the Minimus or the Yukon. Midlayer to boost warmth: warmer than a fleece weighing much more, and windproof too. The WaferLite range are summer-camping super-lights that give real warmth around camp and can boost your sleep system. This WaferLite Vest or the WaferLite Jacket combined with the Wafer Trousers and socks provide a comfortable sleep suit for use with sleeping bags and quilts. This vest is now also available in custom sizes. 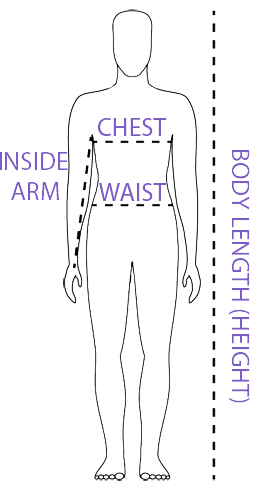 Specify Body Width and Body Length independently to order a made-to-measure down vest. This tailor-made service can cope with sizes from XXXS to XXXL and is ideal if your chest/waist to height ratio differs from standard, ready-to-wear patterns. Please note: If you order a custom-sized version of this vest it will take longer (approximately 45 days) to be manufactured ready for dispatch. 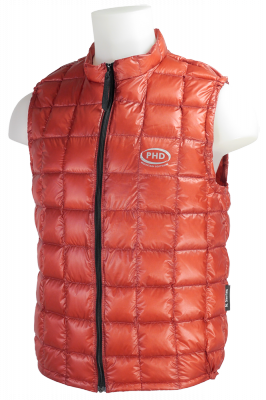 Custom-sized versions of this vest are not returnable and customer loyalty discount cannot be applied. Graham Harvey, testing the WaferLite vest in the Ultra Asia (6000m of ascent across 4 days). 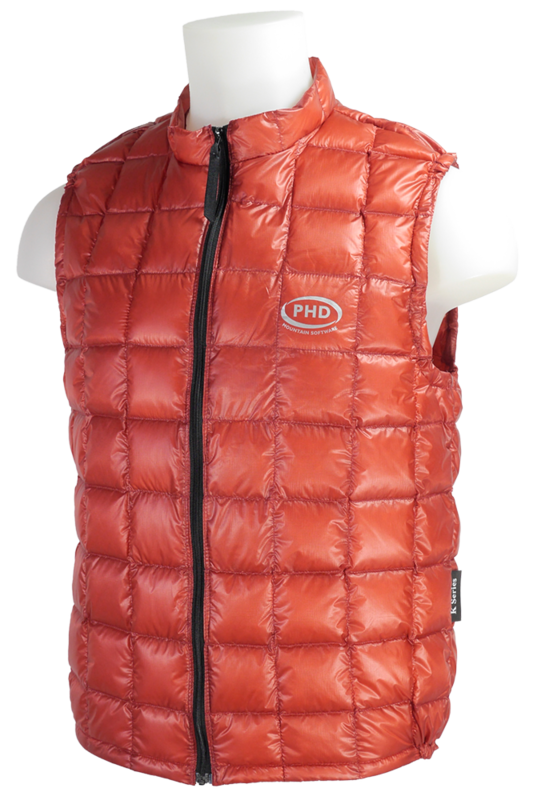 "This down vest is ridiculously light, really ridiculously light. Yet at the same time it is warm, warmer in fact than midweight fleece. It's also amazingly compact, packing down to the size of a tennis ball. The fill is 1000 fill power European Goose Down, the highest fill power down available as far as I know. I was astonished by the warmth it provides. Really, it's quite unbelievable. I have worn it in camp and in above freezing weather it's all I've needed combined with a thin fleece. PHD gives +5°C as its typical operating temperature and I'd agree if it's your main warm wear. However in colder weather it could easily be combined with a light insulated jacket to provide a lighter and more versatile combination than a heavier, thicker jacket. It could also be worn in a sleeping bag for extra warmth. I am very impressed with this vest. I still keep thinking that it can't really be as warm as it is. Given the almost unnoticeable weight and packed size there's no reason to ever leave it at home." — Chris Townsend, TGO Review. "I can't recommend this enough. An incredible product that is functional, packs small and is superlight. I tested it 'in situ' at Richtersveld Wildrun in South Africa and at the Ultra Skymarathon, Madeira. On first impressions it's difficult to believe that when one looks at it compressed in a small stuff sack it could possibly be a down vest. You pick it up and you don't even notice any weight. It is just 3oz. The inner fabric is silky smooth and a pleasure to wear against the skin. I wore the vest with just a t-shirt underneath and found it really comfortable. It may be light but it's warm, really warm. Let's be realistic, it's not for polar conditions. But if you need a warm layer to protect against morning or evening chill, daily colder or cooler temperatures or an additional warmth layer to be added under a Gore-Tex (or similar) or windproof jacket, it's the perfect choice. — Ian Corless, Talk Ultra Review. "It's (probably) the worlds lightest down vest or gilet. Really. That's around the same as, oh, a bunch of house keys or maybe three AA batteries. It packs down to something around the size of an apple. And here's the thing, it actually feels warm. Like proper down warm. The end result though is a garment you can carry without a second thought. Stick it in a bum-bag or pack lid or just in a pocket maybe and forget it's there until you need it. And when you do need it, it's surprisingly warm: bosh it on as an instant windproof body warmer for a quick mid-mission stop. Or alternatively carry it as a supplement to a warmer down jacket to up overall warmth or wear it at night to upgrade a lightweight sleeping bag. In weight terms, it's pretty much extra warmth for next to nothing, which works for us."